Nine in 10 young people are concerned about their mental health, but more than half (six in 10) say they are struggling, according to a national survey by Lady Gaga’s foundation. Most (55 percent) of the 2,000 13- to 24-year-olds interviewed across the US said they were stressed. A third (34 percent) felt hapless or sad most of the time, and nearly a third (30 percent) often felt fearful. 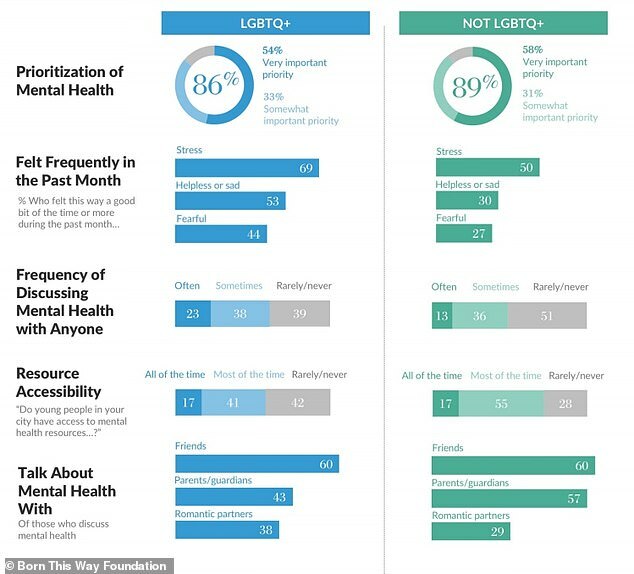 Those figures spiked alarmingly when the researchers looked specifically at LGBTQ+ youth, who were more stressed (69 percent), sad (53 percent) and fearful (44 percent) than their peers who identified as heterosexual. The report, compiled by a research group on behalf of the Born This Way Foundation, found half of under-25s don’t know where to find support, and nearly half (42 percent) say they can’t afford the resources they’re offered. ‘This survey is a clear and urgent demonstration that young people care about their mental health but they are struggling,’ Lady Gaga’s mother Cynthia Germanotta, co-founder and president of Born This Way Foundation, said. ‘They want to learn skills, access tools, and find services that would help them cope with the very real challenges they face but don’t know where to turn – and that has to change. ‘Young people need and deserve resources that can not only help them navigate potentially life-threatening situations but can help them address mental health challenges before they become crises. The Born This Way Foundation was formed in 2012, with 26 young people recruited to advise and guide Lady Gaga (Stefani Joanne Angelina Germanotta), her mother Cynthia, her father Joe, and her sister Natali, who all work with the program. According to Cynthia, the family was driven to create something after their own ‘overwhelming experience’ with trauma. 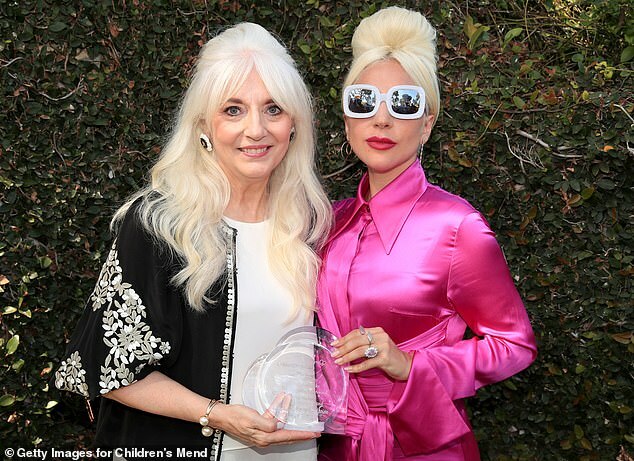 Cynthia’s sister, Joanne (Lady Gaga’s namesake), died prematurely of lupus 12 years before the singer was born, and it affected the entire family deeply. Lady Gaga herself has been candid in public and private about her struggles with her sexuality, bullying, assault, and chronic pain (she suffers from the autoimmune disorder fibromyalgia). Speaking to InStyle recently, Cynthia said she was stunned when her daughters recently revealed they had been bullied but were too embarrassed to tell her. In one instance that stuck with Lady Gaga, her classmates threw her in a trash can. That’s something that is borne out in this new study, published today: many young people do not feel they can speak to their parents about their mental health concerns, but they don’t know how to bring it up with their friends. Cynthia, and the foundation’s executive director Maya Smith, who is also a mother, say this will come as a shock to parents who have an open and close relationship with their children. But at the end of the day it may not just be the parents putting up a barrier: young people may fear a judgmental response, whether that fear is realistic or not. ‘The reality is that there’s still so much stigma surrounding mental health so any opportunity we have to shine a light keeps the conversation at the forefront for young people, but also for the broader public,’ Smith told DailyMail.com. Smith believes this report, the second by the foundation, will further empower young people to feel their concerns are shared and validated. She also hopes it can be put to use, pushing schools to hold more discussions about mental health and incorporate the Born This Way concept of ‘mental health first aid’ – a kind of CPR for the mind, which was rolled out in eight schools earlier this month. ‘There is a gap in prioritization and knowledge, and access to resources. This [report] helps to take this case into schools and workplaces and homes,’ Smith said. For anyone is struggling with mental health, or knows someone who is, Smith suggests looking at the Get Help Now page on the foundation’s website. She also encourages people to think more about hotlines and text lines. Above all, she encourages readers to be proactive. ‘Talking about an experience you’re having will open the door to other people talking about it. They may not know how to start that conversation,’ Smith said.